Publishers’ catalogs: does anyone use these? Presses of all types constantly bombard libraries (and scholars) with glossy and expensively produced catalogs. In my years as a librarian, these have generally been viewed by most of my colleagues with disdain, even in the days before one could pull up a publisher’s title list with the flick of a wrist. So why do they persist? Certainly, one reason is that old habits die hard. Another is that librarians likely report, when asked on a survey or in a focus group, that they do indeed view these catalogs. Having worked in collection development at four institutions, I say bunkus to that. All it takes is a cursory glance at the trash bin next to the mailboxes to put the lie to that statement. Even if a library does use certain catalogs for its work (a rare and dying breed of library), we certainly don’t need 32 copies of it. What is particularly comical/tragic about the junk mailing of academic libraries is that we buy an ever-increasing portion of the few monographs we still buy via approval plans, and do less and less firm ordering of individual titles. Those we do order are often ordered by scholars with specific needs who find the new titles in their field by means much faster and more reliable than scanning paper catalogs, I would bet. Apparently, publishers have an outdated view of collection work in libraries, where librarians sit and ponder catalogs, weighing one title against another. I worked at a place that approached that model (while being far more practical in reality), and in the five years since I left, even that library has gone the path of simplification. From my point of view, this pointless waste of postage, resources, and time should stop, and should have a decade ago, if not earlier. What do other librarians reading this think? Publisher catalogs are just one form of recommendation lists. Do you argue against the (physical) format of this lists, or against listening to publishers recommendations at all? Good questions, Jakob. Specifically, I argue here against the form, due to the horrific waste generated, hence the illustration to the post. Your second question gives me pause. When I did some consulting for a hybrid trade / academic publisher a number of years ago I suggested ditching their print catalogs with RSS feeds (then fairly new on the scene), which I could filter for keywords. As such, I declared myself not in opposition to lists from publishers, although I would replace your term “recommendation” with “alert” to suit my use of this information. I do not trust any publisher to tell me how seminal a given title is to a field, but rather rely both on my domain knowledge of certain disciplines–which can tell me that a given scholar is well-known and highly regarded, which means the book will likely be read and cited–as well as critical reviews in scholarly journals. But going back to the notion of alerts, given the powerful tools available to sort and deliver digital information, I think publishers should continue to push this information out via digital channels (Website, RSS, FB, Twitter, whatever). A simple scenario: a university such as Kansas State purchases precious few monographs or essay volumes in the realm of German literature. We do, however, have two German lit scholars on campus whom we cannot ignore (one is my wife, making ignoring her bad both professionally and personally). These two have fairly narrowband research interests. If I can filter the tonnage published on German lit for a very specific set of keywords, this is very useful. I do this, more or less, with tools provided by Harrassowitz, but those tools can be somewhat inflexible. I work in a medical/academic library. 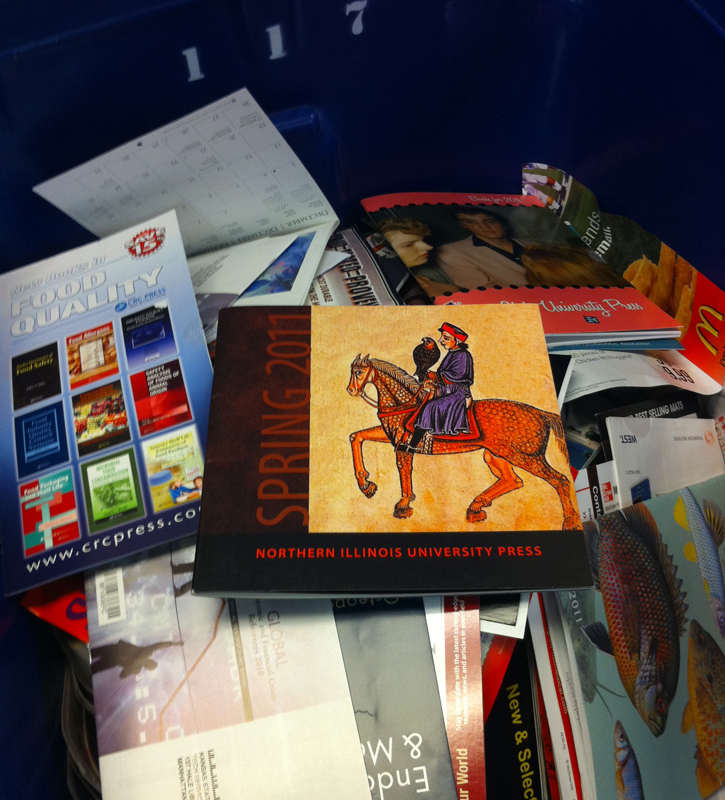 We throw away all catalogs that come to the library without even looking at them, especially because we get sent catalogs on English literature, Cultures throughout the world, and many other catalogs on topics that we are not interested in. Even the medical catalogs we throw away, since my director buys books from 2 publishers mostly, and uses Amazon for requests from faculty or doctors. The one catalog I keep, just for myself, are catalogs I get about library science. I have never bought anything out of them, but I will request a book from other libraries if there is one I am interested in. I use it as a tool to keep up on a little bit of the publishing in my field. Your experience seems typical to me. The vast majority just get trashed, unopened and unread. When publishers lament how high their expenses are (as they announce their latest price increase grossly in excess of inflation), one wonders if they ever examine those expenses and consider eliminating waste. In the end, we the customers are paying for those catalogs, of course, so if we say stop sending them, you have to wonder why they persist.